In this video, you'll find out the best words to use to say no to a project without hurting anyone's feelings and still look like a total pro. What Do You Say When You Want To Pass On A Project? Now you know one of the best ways to handle that potentially awkward acting career situation like a total pro. Remember, it's your acting career. You DO have control over many things (even though sometimes it doesn't feel like it). And the material you decide to work on is your choice. 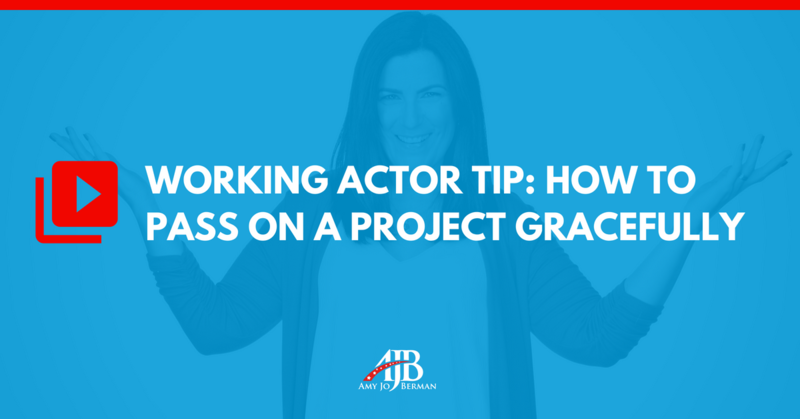 If you enjoyed this working actor tip about how to pass on a project with grace, retweet and comment please. Thanks for the tip! Makes perfect sense and so useful. Good. I hope it comes in handy Harvey! Thank you! Wish I had known this a couple of weeks ago! Thanks Amy, that tidbit was Actually really helpful. pro as always Amy – thanks I’ve been wondering for a while the elegant way to opt out – thank you !
? Super advice. I’ve used the “I’m sooo sorry, I’m unavailable for this project” as well. Great tip! Never thought of “not connecting with a character” as a reason to pass; but that is a good one! Thanks Amy, that’s a great tip ? Always good to have the right words for an awkward situation. So helpful. Thanks so much! Twitter Followers vs. Acting Talent — What REALLY Wins in Casting? Vulnerability, Rejection & Acting Coaches…Oh My!